I've been dreaming about early season lettuce and dark leafy greens, spring asparagus, strawberries............and my CSA!! I just signed up for another season with Chubby Bunny NYC CSA -- weekly share of veggies, full share of fruit, eggs and a (plump) chicken every month. Community Supported Agriculture programs are kind of like a "vegetable of the week club" and a great way to support a farm, eat locally and sustainably grown produce, and be involved with like-minded (and healthy) foodies in your community. Tis the season when CSA organizers begin to collect subscriptions for the June-November 2009 period so SIGN UP for a CSA program before you miss out. Many folks missed out in 2008. I don't want to sound alarmist but despite new, more and bigger CSAs in New York City every season, many of the CSA subscriptions sell out long before all the seeds have been planted! 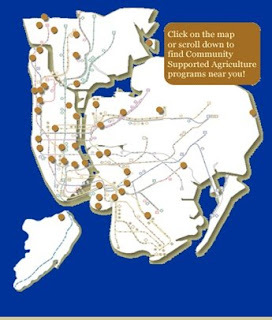 The incredible popularity of CSAs and other direct marketing local food outlets has helped provide a critical link in the (somewhat inefficient) supply chain between farmers in upstate New York and on Long Island and 8 million potential locavores in all five boroughs of New York. And, with thanks to the non-profit Just Food I will add. I'm on the advisory committee of this great organization. A matchmaker between small family farmers and communities of New Yorkers, Just Food provides support to often struggling rural farmers and a diverse population in all five boroughs of the City. With over 60 CSAs delivering food to an estimated 6,000 locavore families from June to November, Just Food provides marketing and infrastructure support to help farms and CSAs that are starting a program or that want to nurture and grow their membership community. This "Light Hearted Locavore" supports all metro New York area farms. But since I'm a Long Island dwelling locavore, I want to draw attention to four farms on Long Island's North and South Forks that have weekly deliveries to New York City during the growing season (as well as farmstands on their property with an abundance of delicious foods though out the Spring, Summer and Fall).